Riddick brought the two together in the film, and in real life. The story of “The Best of Enemies” has been told before. The movie, which is written and directed by veteran filmmaker Robin Bissell, is based on the 1996 book, “The Best of Enemies: Race and Redemption in the New South” by Osha Gray Davidson. 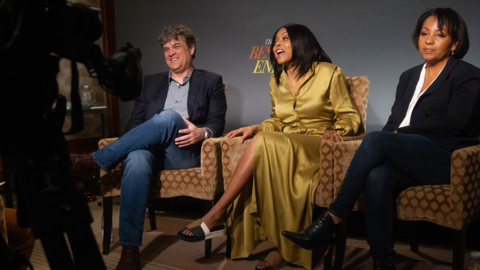 The News & Observer's Drew Jackson interviews ‘Best of Enemies’ film star Taraji P. Henson, director Robin Bissell and producer Dominique Telson. Babou Ceesay, a Gambian-British actor seen primarily in British television and film, plays Riddick. In the film, Riddick is tasked with helping the city decide whether schools should be integrated after a fire dramatically damages a school attended by black children. 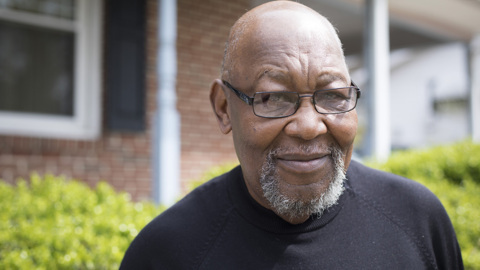 Riddick, now 81, still lives just a few miles from downtown in Southeast Raleigh, where he and with his wife, Delores, have resided since 1969. He has seen the film a few times, attending a recent premiere in Durham with Henson and filmmakers. He was involved with the film before then, visiting the movie’s Atlanta set during filming and talking regularly with Bissell. In an interview at his home, he describes the real events behind the film, and what the film got right. Riddick grew up in a tiny town called Como in Hertford County, near the North Carolina-Virginia border. He graduated from N.C. A&T State University and earned a master’s degree at N.C. State University. He was working at Shaw University the first time he led a charrette on the topic of urban planning. By 1971, Riddick had left his job at Shaw and had his own consulting firm when Durham labor organizer Wilbur Hobby called him to lead the charrette in Durham. Called “Save Our Schools,” or S.O.S. in newspaper headlines at the time, the meetings were federally funded and administered through the AFL-CIO. Watch the trailer for "The Best of Enemies"
The first Durham students to desegregate the public schools were in 1959 after a lawsuit by the McKissick family. But full-scale desegregation did not happen for another decade. While Riddick knew the story had made its way into a book, play and documentary, he didn’t take it seriously when Bissell, known for “The Hunger Games,” called to arrange a meeting with him. But then Bissell’s father came up to Riddick at a theatrical presentation of “The Best of Enemies” at Durham’s Manbites Dog Theater. He told Riddick the interest was serious. Riddick agreed to be part of the film. In real life, Riddick said he was excited to bring Ellis and Atwater together, two people at extreme ends of the issue. But he also had reasons to be apprehensive about working with both of them during the 10-day charrette, which was held at R.N. Harris Elementary School. As for Ellis, he was the perfect person to take part in the charrette. “[Wilbur] Hobby, who ran the AFL-CIO at the time, had told me [Ellis] was the one raising hell about desegregation,” Riddick recalled. There’s a scene in the movie when Riddick approaches Ellis at his service station to ask him to join the charrette. Ellis eyed Riddick, who is black, with skepticism. “That really happened,” Riddick said. But Riddick wasn’t scared to talk to the leader of the KKK, he said. And, Riddick adds, he weighed about 270 pounds at the time. “What was he going to do to me?” he said. As for other participants, Riddick said he felt middle-class African-American Durham residents were less interested in being part of it for fear of risking their reputation. In real life and in the film, former Durham City Councilman Howard Clement plays a role in the charrette. Clement represented the Black Solidarity Committee. Riddick said he remembers the late council member as a middle-cass resident who was part of the system, unlike Atwater, who he said had to jump over the system to get things done. In a scene from the movie, Clement calls Ellis “Brother” during an initial meeting about the charrette. That happened in real life, Riddick said. “When he said that, the noise came from Ann and her group. They really dressed him down. It was awful,” Riddick said. Former Durham City Council member Eddie Davis is the public historian for the city’s 150th anniversary this year. A career educator, Davis came to Durham in 1980. He said the Durham depicted in the film, in his opinion, is more of a stereotype of Mississippi or Alabama. Davis succeeded Clement on the City Council in 2013, in the Ward 2 seat. Davis did not seek reelection when his term was up in 2017. A major scene in the film, and in real life, took place when Ellis ripped up his Ku Klux Klan membership card at the conclusion of the charrette. In real life, Riddick was sitting just a few feet from Ellis during his defiant act. Riddick said he told Atwater and Ellis they would have several minutes to speak at the end of the charrette. He asked them for their notes ahead of time so he knew what to expect. Neither made notes. Ellis went first, and told the room of 200 to 300 people that he agreed to fully desegregate schools. Ellis was shaking. He was moved. “The actual words stuck with me. ‘If schools are going to be better by my tearing up this card, I’ll tear it up,’” Riddick recalled Ellis saying. “I was shocked,” Riddick said. “Shocked. If you take my family out of it, it was the most shocking experience [of my life]. Atwater didn’t speak again after Ellis, Riddick said, because the charrette had succeeded. Riddick didn’t see Atwater and Ellis again until decades later, when Davidson was working on the book about their friendship. Riddick retired in 2004 from a second career working in student health at UNC-Chapel Hill and is now involved in a mental health program for school-age children. He didn’t reveal his involvement in the film to his golfing buddies until they learned of the film’s existence. But thanks to “The Best of Enemies,” in all its forms, his golfing buddies, and millions more, will know. 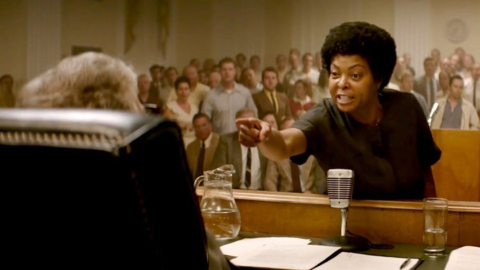 ‘The Best of Enemies’ stars Taraji P. Henson as civil-rights activist Ann Atwater and Academy Award winner Sam Rockwell as Ku Klux Klan leader C.P. Ellis, telling the true story of events in Durham, NC.